A shoulder dislocation is a painful and disabling injury of the glenohumeral joint, which is the main shoulder joint. It is formed where the ball of the humerus fits into a shallow socket on the scapula. Because the shoulder joint is the most mobile joint in the body, it is an easy joint to dislocate (pop out of place). Most dislocations are anterior (forward) but the shoulder can also dislocate posteriorly (backwards). Inferior dislocations are possible but occur much less often. Shoulder dislocations can be a partial dislocation (subluxation), where the head of the upper arm bone (humerus) is partially out of the socket (glenoid), or a complete dislocation, where it is all the way out of the socket. Both partial and complete dislocations can cause pain and unsteadiness in the shoulder. With an anterior dislocation, the head of the humerus slides forward and rests in front of the glenoid. This type of dislocation is the most common type of shoulder dislocation. When the shoulder dislocates posteriorly, the head of the humerus moves backward behind the glenoid. Posterior and inferior shoulder dislocations only account for about 5 to 10 percent of all shoulder dislocations. In many cases, the shoulder “pops” back in position on its own. This repositioning following a shoulder dislocation is called shoulder reduction (also called “reducing the shoulder”). A shoulder dislocation is an emergency and if your shoulder dislocates and does not pop back into place, you should go to an emergency room right away. Many health care professionals, including those in the ER, know how to manipulate the shoulder back into the socket. Severe pain stops almost immediately once the shoulder joint is back in place. In most cases, your doctor will recommend immobilizing the shoulder after it’s been reduced, by placing your arm in a sling or other device for several weeks following treatment. You will also be asked to rest and ice the sore area a few times throughout the day. Eventually, once the pain and swelling go down, you will be prescribed rehabilitation exercises to help restore the range of motion in the shoulder as well as strengthen the muscles that hold the shoulder in place. These often start with the physical therapy team and are then continued at your own pace. Despite adequate rest and rehabilitation, some patients develop a problem with having the shoulder continue to pop out of socket. The term for this problem is recurrent instability or dislocation of the shoulder and unfortunately is the most common complication after a dislocation, especially in young people. Older adults, however, are more likely to experience chronic pain, stiffness, or a torn shoulder tendon. When conservative care is unable to restore shoulder stability and normal function, surgical intervention may be needed. Our orthopaedic surgeons will perform a thorough history and physical exam to assess the damage to the shoulder joint. Imaging studies such as x-rays, MRIs, and CT scans are frequently ordered to properly assess the soft tissues and bones around the shoulder joint. If the shoulder can't be reduced manually or if a sling and rehabilitation program does not control symptoms of instability, then surgery may be suggested. The main goal of shoulder dislocation surgery is to reduce and stabilize the shoulder. Restoring normal motion and function and preventing recurrent dislocations are important outcomes of surgical intervention. One of the most common surgical procedures for shoulder dislocation is the Bankart operation. 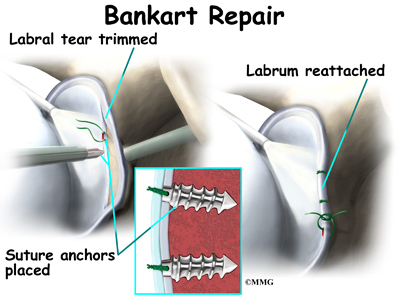 The Bankart procedure involves re-attaching the torn labrum and capsule to the front margin of the glenoid cavity. This operation is primarily done in an arthroscopic procedure. Some patients who have had several shoulder dislocations can develop changes to the soft tissue and bone of the shoulder joint requiring more in depth and complex surgical reconstruction. Techniques such as remplissage, bone grafting, Latarjet, and anterior subscapularis augmentation may be discussed in some more severe cases of injury. Nearly all shoulder reconstructive surgeries like the Bankart procedure are done on an outpatient basis, meaning you go home the same day as the surgery. After dislocation surgery, your shoulder will be immobilized in a sling for up to 6 weeks. Once initial healing occurs, you will return to physical therapy to strengthen the shoulder over the course of the next 4 to 6 months. This will help reduce the likelihood of the joint dislocating again and improve your mobility. You can learn more about shoulder joint replacement surgery by downloading our educational document A Patient's Guide to Shoulder Dislocations.